The Mississippi Occupational Therapy Association (MSOTA) was established in April of 1976. Prior to 1976, Mississippi and Alabama occupational therapists were a joint state association known as the Alabama-Mississippi Occupational Therapy Association (AMOTA). By April 1976, the separation of Mississippi and Alabama was complete, and a slate of officers was elected to MSOTA. The first newsletter was published to a membership of approximately 22 members. 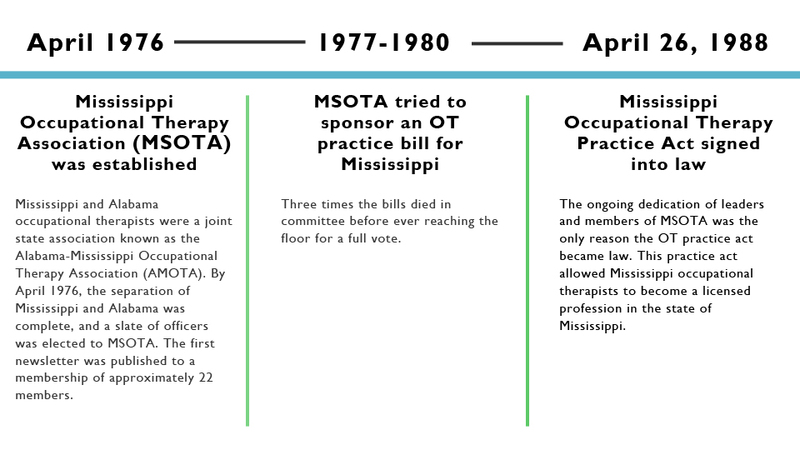 From 1977 to 1980, MSOTA attempted to sponsor an occupational therapy practice bill at least three timesat the Mississippi state Capitol, but these bills died in committee before ever reaching the floor for a full vote. On April 26, 1988 a Mississippi Occupational Therapy Practice Act was finally signed into law. The ongoing dedication of leaders and members of MSOTA was the only reason the OT practice act became law. This practice act allowed Mississippi occupational therapists to become a licensed profession in the state of Mississippi. From 1976 to present, MSOTA has been continually committed to the advancement and safeguarding of occupational therapy in the state of Mississippi. The present day success and effectiveness of MSOTA is dependent on an active board of directors and a strong membership base.